Talking circles are effective to promote learning. By asking students what they found most important/useful/challenging/thought-provoking/applicable/confusing in a unit, the teacher can identify the learning needs and reinforce key content. Circles are also very effective to encourage sharing of student writing and peer feedback. Teachers use circles at the beginning or end of the week, as one example, asking students to share highs and lows of their week or weekend. Circles can also be used to establish classroom norms, address painful incidents in the school or broader community, or address negative patterns of behavior. Problem-solving circles are used when there are behavioral problems impacting a whole class. The circle explores who has been affected by the behavior, in what ways, and what needs to happen to make things better. Individual students are not singled out as wrongdoers, and the whole class is asked to be accountable for improving the situation. A voluntary process bringing the wrongdoer and those affected by the harm, possibly including family members, teachers/staff, administrators, other students, and school police. 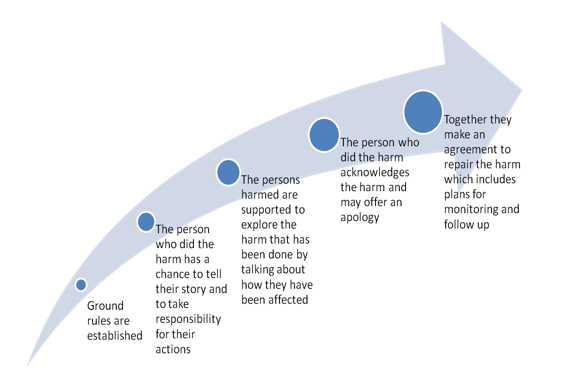 In a conference the person harmed is empowered to express how they have been affected, ask questions, and assert what they need to repair the harm done. The wrongdoer gains the opportunity to be accountable, express remorse, and to make things right. Restorative conferences provide schools the opportunity to address conflict and harm in ways that enhance positive youth development, as an alternative to suspension and expulsion. Restorative chats/dialogues are used by teachers or staff to address minor incidents that occur in classrooms, corridors and school grounds. Taking just a few minutes, the conversation can be held with just the wrongdoer(s) or with a wrongdoer and the student harmed. The teacher asks the wrongdoer what they were thinking when they did x? who has been affected by what you did? in what ways? how can you fix things? The student harmed is asked a parallel set of questions and then agreement is reached on how to make things right. Using circles in advisories or student support meetings can help students develop social and emotional literacy, receive and give support, build trusting relationships, and address personal and academic challenges from an asset-based perspective. Circles can be used in large meetings for stakeholder groups, especially when addressing issues that are emotionally charged for some members of the school community. Forming talking circles for a portion of a larger meeting discourages polarization and enables everyone to have a voice and to be heard by others. Circles encourage sharing on a deeper level, and promote understanding across differences of class, race/ethnicity, school role, and points of view. All too often, parents and students feel marginalized, inadequate and overwhelmed by the dynamics of IEP meetings. Using a talking circle for the meeting creates a very different dynamic that fosters inclusion, gives voice to all participants, respects what the family and student bring to the table, and creates a sense of team support for the student’s learning and development. Adult members of the school community also benefit from circles, when used to promote peer support and address conflict in healthy ways. As teachers, administrators and staff begin the paradigm shift to restorative thinking, they enhance their own teamwork and serve as role models to students.